WELCOME TO THE GRUB 'N' GEAR WILDERNESS CAMPING COMMUNITY. It's all about living well and eating well while wilderness camping! Plan your meals, and get your backcountry camping supplies here. THIS IS WHERE BACKCOUNTRY CAMPERS COME TO GET ORGANIZED. organize your backcountry camping trip with the help of the online community. share what you know and get advice from other campers before heading into the wilderness. trade food ideas, packing ideas, and get equipment recommendations. find trip partners, shuttles and other resources. share your adventures by posting your journals. share your photos and videos of your trips. for your safety, log wilderness camping trip plans with your friends before you leave. Submit your wilderness camping pictures to be displayed here. Whether you are a complete novice or a seasoned, wilderness traveler, there is something here for you. No matter how you plan to enjoy the backcountry, this is the place to find resources, information and travel partners. If you love to hike over sun drenched alpine meadows in the Rockies and scale their remote peaks, backpack trails through virgin forests, paddle long, mist shrouded shorelines in your sleek sea kayak on the east or west coast or ply the waves of the Great Lakes, portage Canada's waterways, gliding down fast rivers and traversing sparkling, fresh, wilderness lakes out on the Canadian shield or live and travel in the wilderness by any means in this vast country, you are part of this community. This is the place to share your adventures. Post the journals of your travels here. We all want to read about your fabulous experiences. Post your backcountry adventure pictures too. We would love to see them. As you prepare for your next adventure, if you need anything, this is a good place to start looking to find it. If you need a travel partner or a shuttle, let everyone know. If you need information, ask. If you have information or recommendations, this is the place to share them. If you have anything to offer, this is the place to connect with those who will benefit from what you have. Those of us who love to enjoy the great outdoors in the backcountry have a special bond and share something unique. Lets all help each other out and inspire each other. Together, we can make this the best, online, backcountry, wilderness camping network there is. CHECK OUT THE BACKCOUNTRY CAMPING FOOD PLANNER. 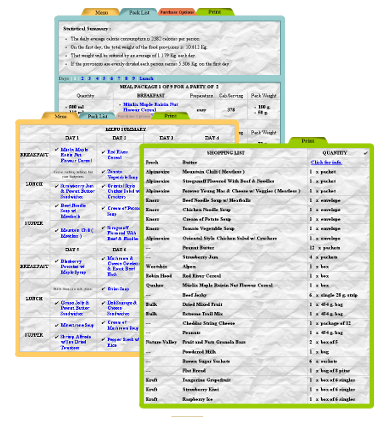 THE BACKCOUNTRY CAMPING FOOD PLANNER IS A FREE SERVICE. The planner is a powerful tool that will help you do detailed trip planning to a degree that has never been possible before. Have a look at the examples of the thorough planning that is possible. You can travel with confidence, knowing you have brought the right resources to sustain you on your camping adventure. Whether you travel by canoe, or travel by kayak or travel on foot, how much you have to carry is always a concern. Now you can know just how much to pack. You can know, even before you buy your groceries, how much they are going to weigh, once you have disposed of the extra packaging and the food has been portioned and readied for the trip. Proper food planning used to be a long and difficult task involving many hours and lots of guessing. Now you can organize all of your trip rations in minutes, and have far more information about calories, weight and portions then you could ever dreamed of. This is how you can optimize your trip plans as never before. For reasons of security, the Store's login account is seperate from the Forum/Gallery's login. Registering with the Forum will also give you access to the Gallery. The Grub 'n' Gear Forum FAQ is here. Let us know if you would like to see your video clip here.